I’ve been waiting for a bike like the MT-10 for years now. Maybe not exactly this bike but one so similar in my mind… As soon as I rode it I was working out ways to buy one. Not many bikes in my decade-long career as a motorcycle journo have inspired me in such a way. Funnily enough, another Yamaha product was one such bike. When the MT-01 came out (circa 2005) I loved the look of it. It was flawed in some ways, and expensive, but after a long term test of one I wanted one bad. Life always tends to get in the way, and riding lots of bikes for free probably stopped me from exploring a purchase of one in more detail. The MT-01 is now a bit of a collector’s item. They didn’t sell well, due to the price mainly, but most still command around 10 grand. That’s a mistake Yamaha has not made with the MT-01, one of the most amazing bikes I’ve ever ridden, it’s a snip at $17,999. The reason I’ve been waiting for this bike for so long is that I’m a big naked bike fan. It’s what I grew up riding, and while Yamaha has built loads of great R1-inspired naked bikes, it’s never built one with a crossplane crankshaft engine, a big bang donk if you like. Until now of course. It has a real presence this MT-10, in size, in sound, in feel. 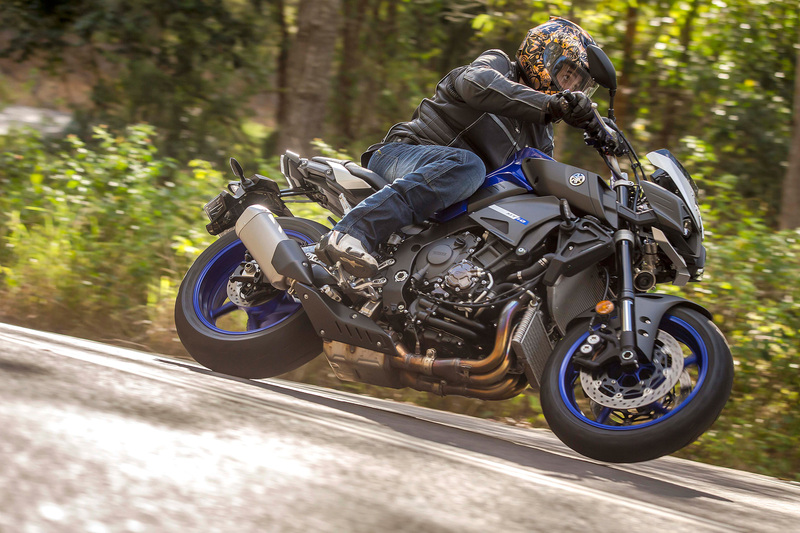 It makes Yamaha’s MT-09 feel small in comparison. It is a very worthy successor to the MT-01. Yamaha’s latest version of its crossplane crank engine is pretty special. Exactly why Yamaha chose this layout over half a decade ago comes down to a few factors in my mind, the main one I believe was to build something different from their norm. It worked for me, the R1 had an evocative sound and feel to the engine. I loved it, but it never quite made a successful race engine across the board, although there was some localised wins success here and there. It was powerful for sure, but it had quite a heavy crankshaft and was down on power in standard form compared to its competition. But I also believed it would have made a great road engine for other less race-oriented models. Exactly why Yamaha never did this is a mystery to me. When Yamaha released the latest generation R1 a couple of years ago, the engine got an impressive power boost, right up to the 200 hp mark. With a 270-180-90-180 firing order it has a sound all of its own, very much like a V-four but different. It has a lumpy feel to it too, one that’s hard not to be impressed by. In-line fours are so last year don’t you think? Retuned not detuned is the catchphrase you need to grasp here too. Sure with 160 hp the MT-10 has a few ponies less than the R1 but who cares. Riding the bike you’d never really know it. Power had to be moved much lower down the rev range for the typical MT-10 rider, the one Yamaha envisaged at least. This was done by changes to intake, exhaust and fuelling systems, specifically different pistons, combustion chamber shape, airbox, throttle body, camshafts and so on. They are only minor in the scheme of things but all work together to make a more harmonious engine for street duty. Peak horsepower and torque are achieved at lower revs too – 12000 compared to the R1’s 14000 – so it all feels less ‘frantic’ than in the R1. Another area the MT-10 engine differs from the R1 is the crank, with the MT-10’s unit 40 per cent heavier, which is one of the reasons the engine revs lower and has a more relaxed ‘feel’ on the road. In it’s transition from R1 to MT-10, the engine has retained the assist and slip clutch. There are some changes to feel for better road manners but it is essentially the same design. It has a slanting cam design that is located between the clutch boss and the pressure plate. This mechanism gives a better ‘mechanical advantage’ of the clutch springs and consequently allows the use of lower rate clutch springs in the MT-10, giving a much lighter feel at the clutch lever. If you check the Deltabox frame out it all looks much the same as the R1. It is the same dimensionally and in style but it does have a few tweaks to change the rigidity and strength attributes. In other words it is just as strong as the R1 but has a more flexible nature, just the thing you need for tackling everyday roads rather than racetracks. Mass centralisation is also a factor here, with the weight bias slightly more to the rear compared to the R1 which is what you might call more nose heavy. Incidentally this is once again great for the track, not so much for the road. 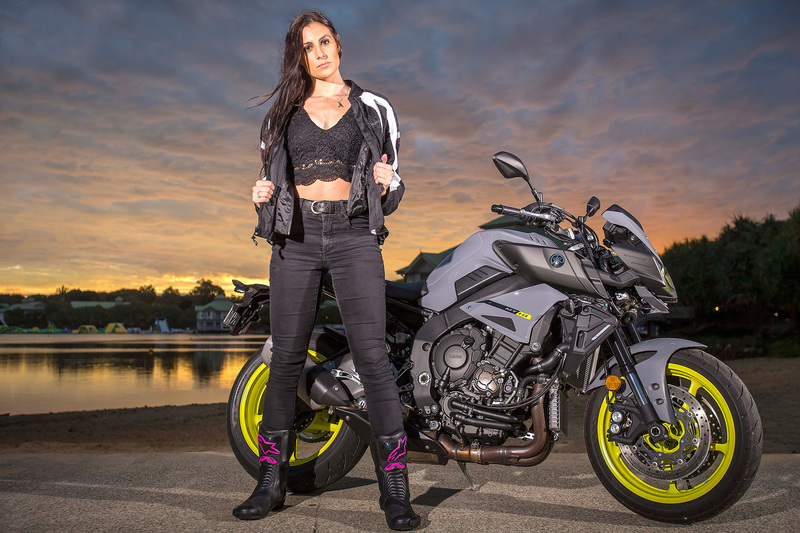 Part of this change in weight bias is down to the riding position of the MT-10. Rider aids are expected on all of the bikes in this market sector these days but rather than go ballistic like some manufacturers, Yamaha has given the rider just the right amount in my opinion. There are three Riding Modes, with A, B and Standard. Each mode has full power but different throttle responses along the way. With the fly-by-wire throttle, the ECU changes the initial throttle response depending on the mode selected and after a certain point full power and torque are delivered. A Mode is the most powerful and does have quite an aggressive initial ‘hit’, while B Mode is better for less than ideal road or weather conditions. There are three traction control settings, and like the Riding Modes they are all easily accessible via buttons on the handlebars. Both the traction control and ABS can be switched off, which might be fun on the track but needed on the road, as the settings have been well developed by the test riders and engineers. As an example, in A Mode and the least traction intrusion you can still wheelie like a madman. Yamaha has fitted cruise control to the MT-10. It is a fairly fault free arrangement and is selectable only in fourth, fifth and sixth gears, between 80 and 180km/h. The only thing getting in the way of this bike being a very good long distance machine is the seat, which is a bit on the hard side. I do have to say that I’ve always suffered from a soft backside so this could have something to do with it. It’s a refreshing attitude from Yamaha to minimise the rider aids on the MT-10 to just what’s needed rather than going full space race as a marketing ploy. If you rode an R1 back to back with the MT-10 you would easily tell the difference. They sound the same, and there’s a power difference of course, but the way the engine lopes along compared to the R1 is one of the biggest differences. The engine has been retuned for better bottom and mid range grunt and that’s what you get. You can rev the daylights out of it but there’s no need to. It’s the sort of engine that allows you to be a little lazy and short shift it, but responds well to high revs as well. The engine changes characteristics when it gets between 6 and 7,000 rpm, really lifting its skirts and making serious forward momentum. The MT-10 has lower gearing than the R1 too, so this gives the impression of a smaller power deficiency than is actually there. It has an amazing sound too, even with the standard exhaust. It has a real growl to it. Then we get to the suspension, which as you would expect on a bike of this type, is fully adjustable. On paper it looks spot on, with 43mm KYB forks up front, and KYB used again for the shock. With the forks and shock set just on the hard side of the middle settings it handled the road conditions very well. The suspension is quite a good compromise all round, a real sports touring set up, and showed Yamaha has got the settings on the mark. These settings were fine for fast road riding and even touring, and wouldn’t be out of the question for a track day either. I haven’t forgot about the brakes either. Two four-piston radial calipers hug 320mm discs which have the bight of your next door neighbour’s pit bull and the suppleness of your next door neighbour’s wife all wrapped in one. When bikes are great to ride the styling doesn’t really matter to me. I wasn’t all that enamoured with its styling until I saw it in the flesh, then I got it. The primer grey with yellow wheels doesn’t do it for me in the slightest but the black does. If I bought one, and I might just do that, I’d get the wheels painted gold and put a set of gold anodised handlebars on it, just for a touch of flash, and a small screen set up for a bit of extra protection for longer rides. Everyone has a different idea of comfortable but I can tell you the MT-10 fits me perfectly. 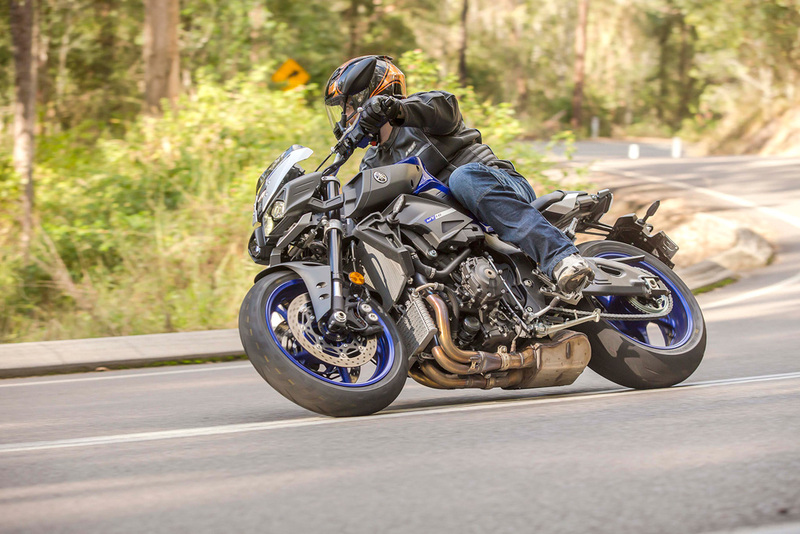 It doesn’t look to be a big bike but it feels like a big bike, especially compared to Yamaha’s MT-09. Even very tall people will have enough room. At six foot I can put both feet flat on the ground, just. 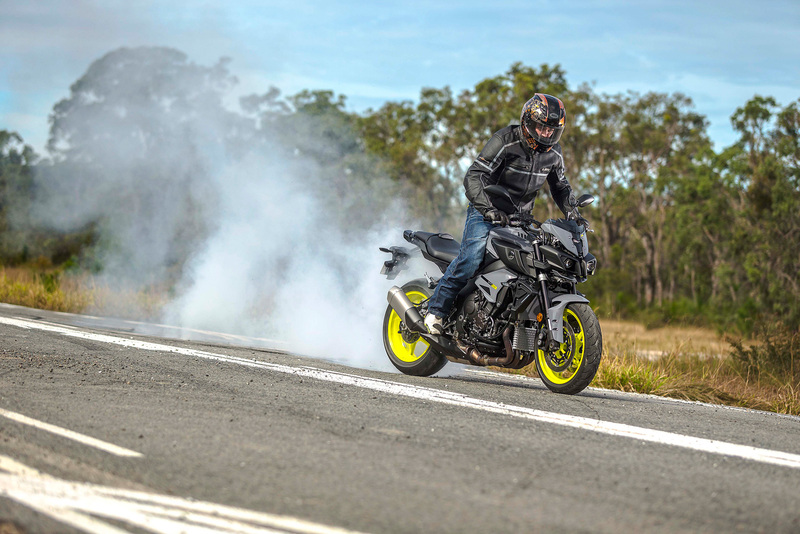 During the launch we sampled the MT-10 on quite different roads. For such an impressively fast bike it’s easy to ride in traffic, easy to ride at high speed and even in tight bumpy back roads it’s easy to live with too. Having such a flexible engine and suspension which works as intended made dealing with a less than ideal section of road a breeze. The riding position helps of course but wow, what a bike. Yes you should. And at $17,999 why wouldn’t you?